Hey everyone! 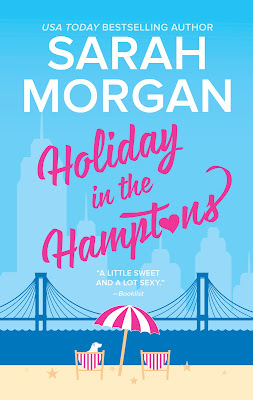 We are super excited to announce a tour we're hosting for HOLIDAY IN THE HAMPTONS by Sarah Morgan which releases on August 29th! The tour will run for three weeks - from August 7th-11th, 14th-18th & 21st-25th will have one stop per day and will consist of a mix of reviews, interviews, guest posts, and excerpts. The bloggers who are chosen as hosts for a an interview or guest post will be required to come up with interview questions (at most five) or guest post (at most 3). Interviews will be author or character interviews. There will be a super special KATE SPADE Themed Giveaway! We are totally stoked for the tour for HOLIDAY IN THE HAMPTONS this August! We can't wait for everyone to read it! Professional dog-walker Felicity Knight loves everything about New York...until her ex-husband starts working at her local vet clinic. She hasn't seen Seth Carlyle in ten years, but one glimpse of him--too gorgeous, and still too good for her--and Fliss's heart hurts like their whirlwind marriage ended yesterday. So when her grandmother in the Hamptons needs help for the summer, it seems the ideal way to escape her past. Sarah Morgan delights with more love and laughter in her acclaimed series From Manhattan with Love, which Publishers Weekly calls "engaging...a classic sweep-you-off-your-feet romantic experience."